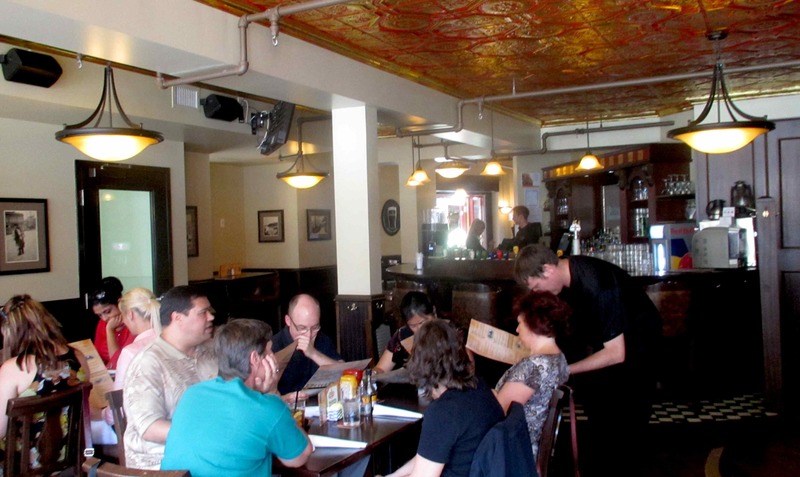 The interior of the place features lots of polished wood and seems to have a very cozy and inviting atmosphere. It would be a little cramped when full I expect and I estimate that it seats somewhere in the range of 60-80 patrons. 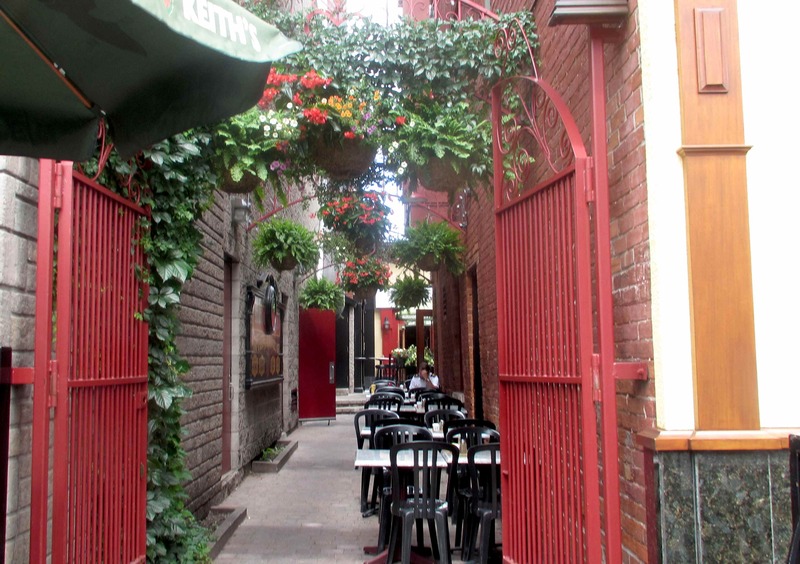 The front patio seats 20 or so and there is also outdoor seating around the side and back of the building which is shared with the Heart and Crown and two other associated Irish Pubs called Mother McGintey’s and The Black Rose. 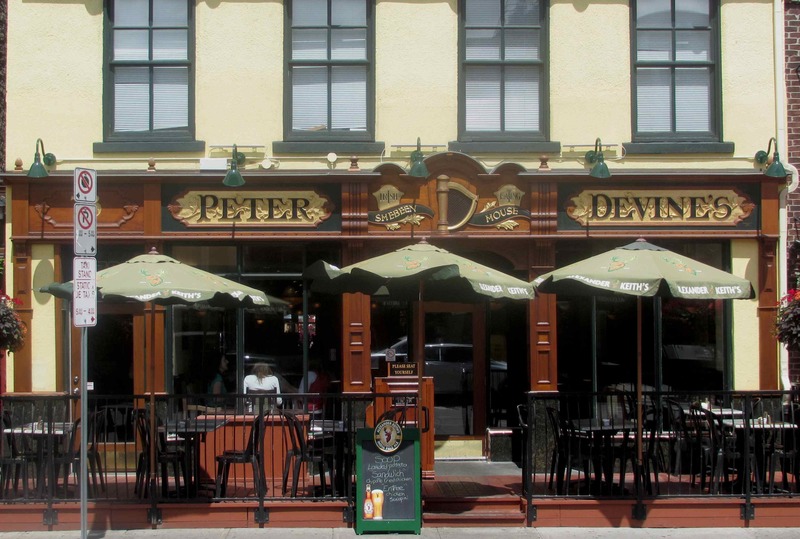 The menu is a bit of an eclectic mix of simple pub fare and more complex, up-scale offerings such as lobster ravioli, a very delicious sounding Fisherman’s Stew, and a Thai style chicken curry. I was a little intrigued by the Lobster Poutine and also the ‘Irish Standard’ Chicken Curry and Chips which is described on the menu as an ‘Irish Standard’. For this meal, however, I decided on something a little bit lighter. 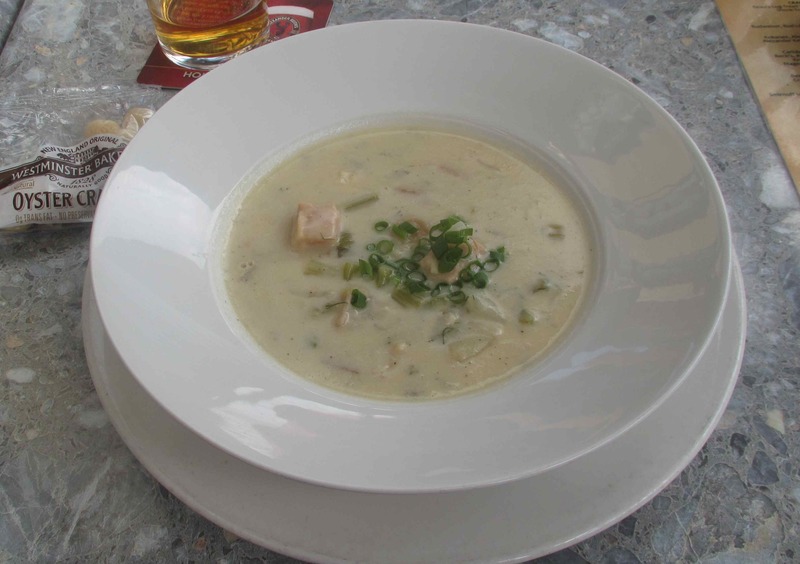 Seafood Chowder – This is described on the menu as containing sea scallops, shrimp, Atlantic salmon, haddock, bacon and Yukon gold potatoes. In all, this was very nice, although it was a little light on the promised seafood, with just two chunks of salmon and one shrimp being clearly identifiable. The base was a vegetable puree of potato and, possibly leek, and was simply and deftly seasoned. Fresh dill was included and, while I might have gone a little lighter on this, it worked pretty nicely. Even given the scarcity of good chunks of seafood, I thought this pretty good value. Rating: 4 out of 5. 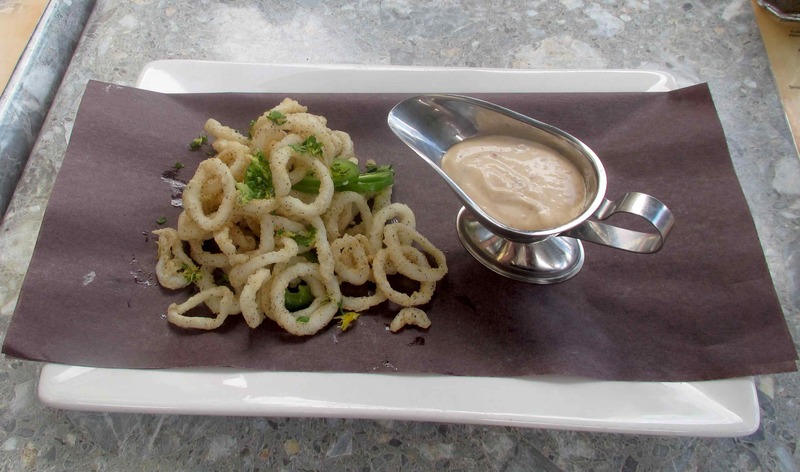 Crispy Calamari – The squid rings here were tossed with a gremolata and fresh jalapeno and there was a mayonnaise based dipping sauce with smoked jalapeno mixed in. It was nicely presented, I thought, but not the best deep-fried squid appetizer I have had. It wasn’t very crispy, and the squid rings were really too small for this type of use. Beyond that, though, it tasted quite nice and the parsley and lemon zest in the gremolata added some nice high-notes. The dipping sauce wasn’t bad but I can’t say that the smoked Jalapeno came through all that well. Rating: 3 out of 5. I like this place place. 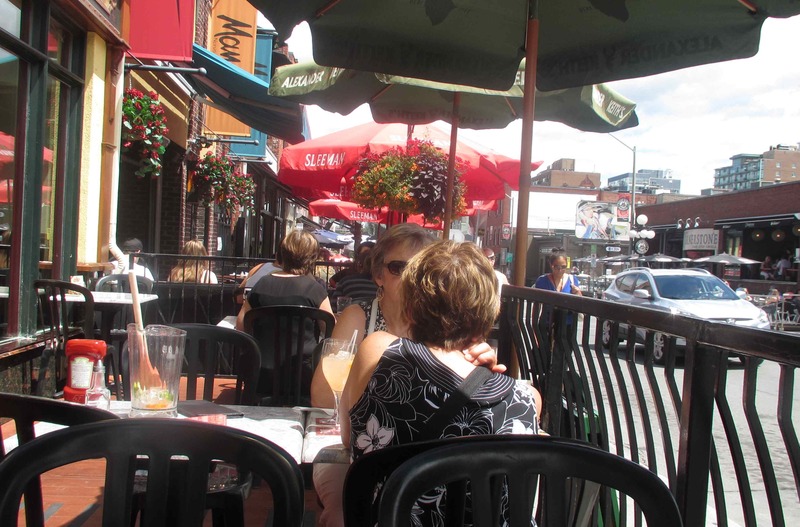 The menu has a little something for everyone and the surroundings are definitely very pleasant. The service was good and food decent. Rating: 4 out 5. Love the look of this little place….Lovely post! Thank you 🙂 It is very much the sort of place I would like to have as a ‘local’ pub.